The vet told us Crystal, a sick cat from Jean’s colony, was suffering and hasn’t eaten while hospitalized there since last Friday. Crystal has necrosis of the left ear, and it is completely gone, bloody and crusted. 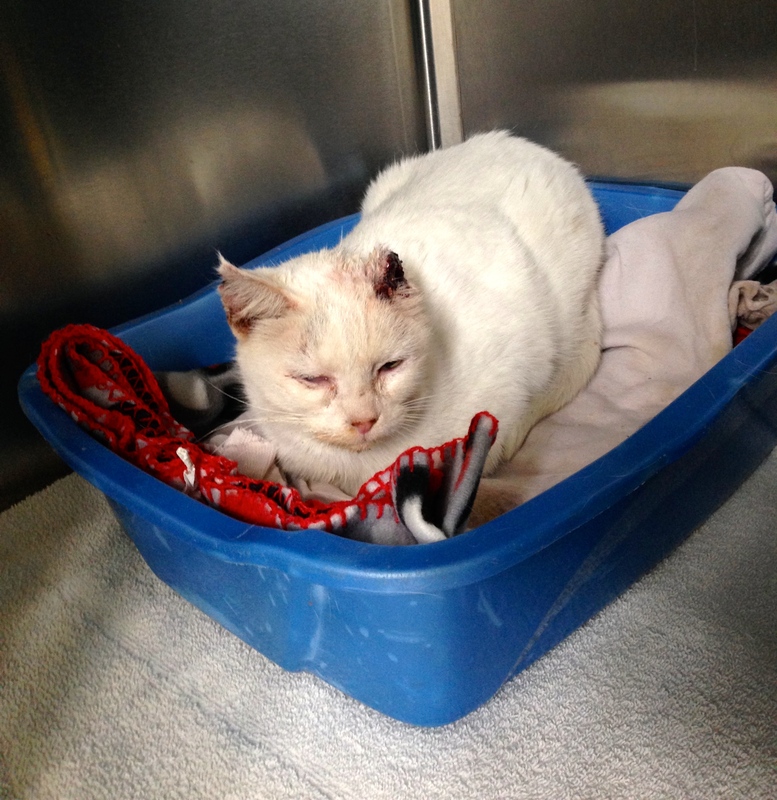 Her caregiver, Jean, trapped her last Friday and Joann rushed her straight to our vet, Elmhurst Animal Care Center. 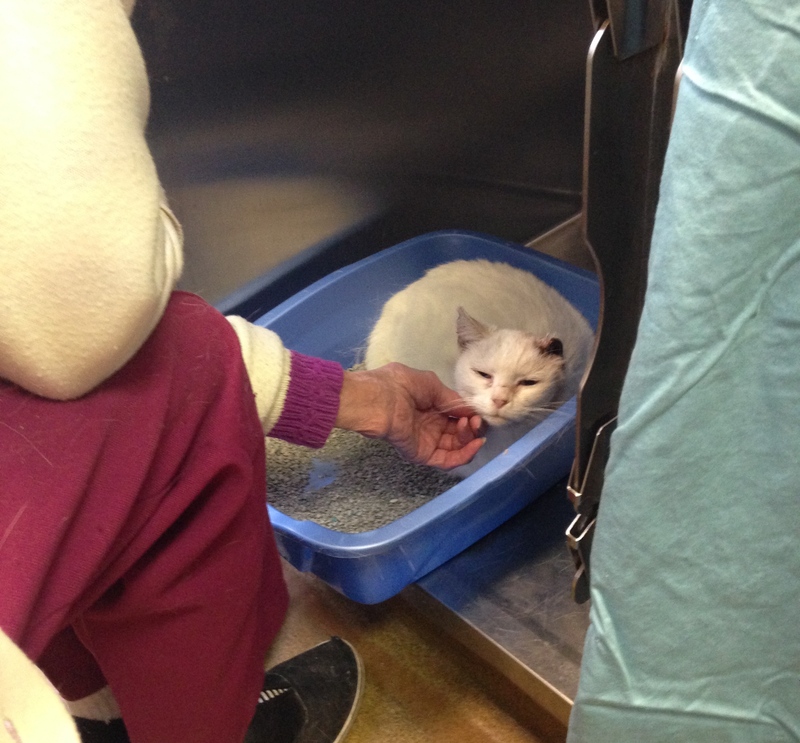 She has been there ever since, medicated and under observation, while we wait for the biopsy results. Since Crystal is an outdoor colony cat who is familiar and bonded with Jean only so far, we hoped that she might feel better if she actually SAW Jean. Cats can shut down easily and be terrified in such alien environments, even though they know they are being helped and stabilized with medication. Crystal’s appearance is still alarming but now that she has recovered from surgery and cleaned up she looks so much better than last week. We are so grateful for Elmhurst’s expert care! Joann drove Jean to the vet for a visit. When Crystal saw Jean the results were spectacular, better than we could have ever hoped. 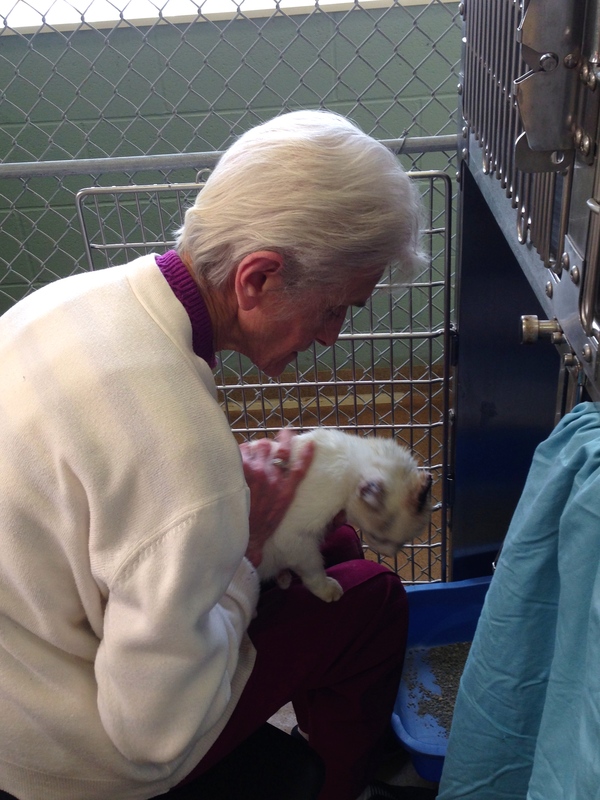 Jean was able to touch and pet her. Then she fed her a full meal by hand. And she was able to hold her. This is such a testament to what we are all capable of when we are compassionate and caring. Age and circumstance do not limit us. Jean has a special touch with these cats, and they respond. We are still waiting and hoping for a positive outcome for Crystal. We’ve learned a lot from both of them this past week.